These players were compared in an extensive listening session. To keep the story interesting, I won’t give away the results here, but I can tell you that there are some surprises… Please read on! All players had plenty of playing time and were well-run in as well as kept powered up and running cd’s prior to the review. Used were the same powercables, all connected to the same star-wired extension block. All players were placed on the floor on their own feet. 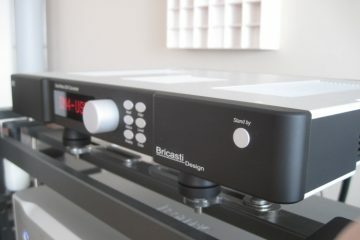 The interlink used was the same Transparent Ultra XLR, connected to the same position on the preamp, that was swapped from player to player. In a later stage, after we had our first opinions about the differences between the players, we tried to optimise each player individually with different cables, feet and placement. The little Meridian always surprises. Neither dull nor analytical, never slow but also never hurried and blessed with fine detailing it always seems to hit all the right notes. 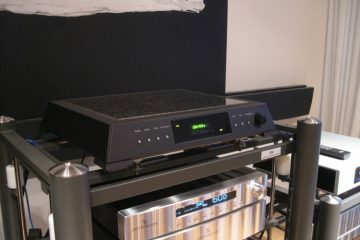 It has ample bass: deep and solid, although it could have been a tiny bit more visceral, like the Wadia. But VRDS transports are king of bass, nothing you can do about that. But the Meridian is very quick in the bass. It’s more agile than the Wadia. It’s also got airy, fluid highs and a very natural, although slightly recessed, midband. There’s really nothing severe that you can say is wrong about this player. 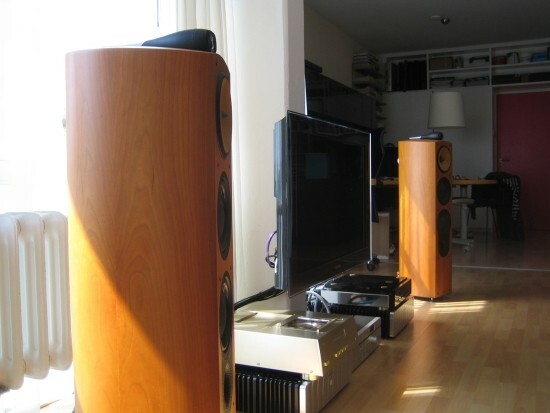 Until you compare it to others costing three times it’s price and put on your audiophile head. Then you can pick holes in its presentation. 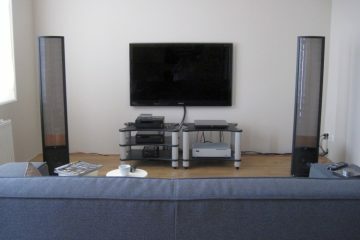 But even then it holds strong, showing the Wadia and the Krell a thing or two. At first the presentation seems not to be that much different. but then you notice that the stage is a lot wider. Not only is it wider, it also has more air around instruments and voices and everything feels more real. In comparison the Meridian paints a smaller picture. Also evident is the more synthetic colour of the Meridian compared to the CEC/Enkianthus. Meridian sounds a bit less real, more like an electronic component. Next we notice that the highs are a bit more rough than the Meridian’s. 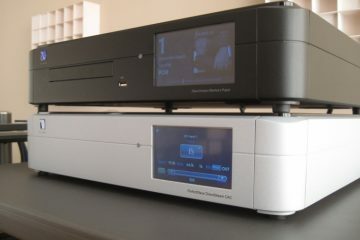 This is something I’m aware of is the Audiomeca DAC’s fault. This dac is very dynamic, transparent and lively but you pay a small price because the highs are just a tiny bit more rough than possible. (This was first evident in the DCS-Audiomeca test a while ago) But on the positive side again is the more real, more visceral, live presentation of the CEC/Audiomeca combo. It has an analog sense of presentation just like the Meridian but is more expansive and has a broader palette to paint from. The interesting thing is that the CEC/Audiomeca combo can be really intimate and relaxed, and suddenly really wow you in bombastic crescendo’s. The analogness is even a little better through the CEC/Audiomeca than on the Meridian but again, with a small tradeoff. The CEC’s bass is ever so slightly slower than the Meridian’s. Not that the CEC lacks slam because it can be really lively, but the bass is what makes the Meridian have slightly better PRAT with the appropriate recordings. What is immediately evident is the smooth, creamy fluid presentation. Highs are super-smooth and lightly airy. of course you hear the CDM9 swing arm transport at work here. 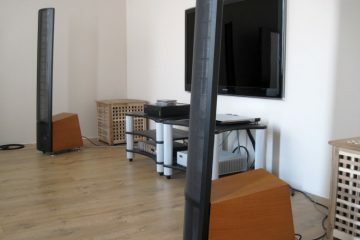 This is very recognisable from the other Philips and Marantz players I’ve tested. 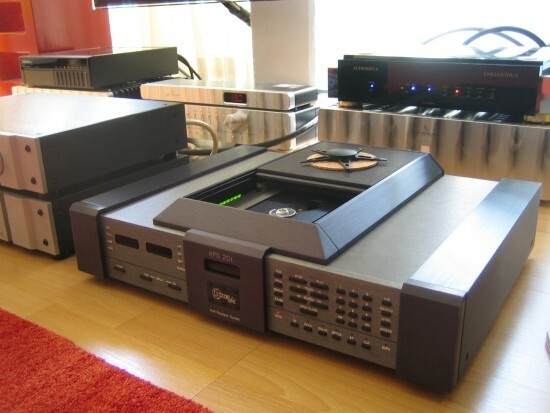 In fact: the Krell sounds like a hot rodded Marantz CD94MKII. Sorry, I didn’t want to insult any Krell owner, but it’s really true. And the old Marantz souns a lot better than most people give it credit for. 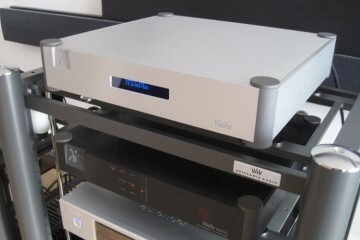 But of course the Krell has much better detailing because it doesn’t use the ancient TDA1541 Philips dacs. In fact, it rivals the Meridian for detail, but not the CEC/Audiomeca combo which in that department definitely has the edge. Along with the incredibly airy highs comes a slower pace and a lack of attack in the midbass. The midband, although lush and creamy, is also a bit underlit and this takes away some exitement. PRAT is not this players forte. I’d say that the Krell is the creamiest and most relaxed player of the quartet. It’s most suited to laid back listening. 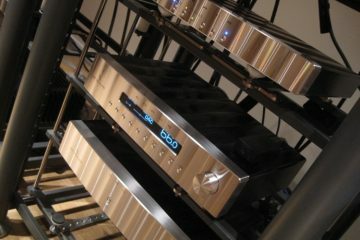 It doesn’t have the power you assosiate with Krell amps. But then, it is no amp. This player is a tank. This doesn’t say anything about the sound, but really, this thing is huge. The sound somewhat resembles this appearance: Bold, beefy, solid and very confident. The Wadia bass is renowned and not without reason. It easily has most bass of all players. And not only a lot of bass; it’s also very deep and solid. It seems to possess real mass. On that foundation comes the most “live” midband I’ve heard. Percussion, woodwinds and piano in particular sound very visceral and realistic. It simply has a lot of temperament. 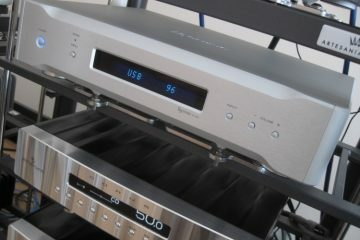 Also the Wadia has the best soundstage layering I’ve heard yet. Lead singers really stand out from the mix, right in front of a very wide and well-defined soundstage. Alas higher up the frequencyband comes the payoff. There’s always a tradeoff. Even with Wadia’s. It’s the higher midband and high frequencies. They are darker and drier than any of the other players. It’s not that the Wadia is coarse because it’s not. It’s just not that fluid in the middle and a lot darker in the highs. It lacks the air that the other players have and that gives cd’s an analog feel. But digital the wadia isn’t. It’s just a different approach. it’s analog in the sense that it sounds very credible and real. It’s not analog in that it mimics lp records and their fluid airy highs. It also has a lot of character and this character simply has to match your system and taste. PRAT. 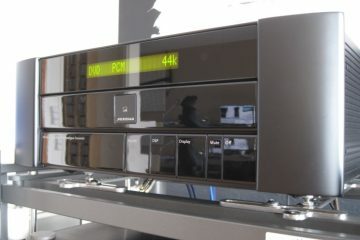 The Wadia has it, but everything has to be right, or the machine tends overheavy and perhaps in some setups even boomy. 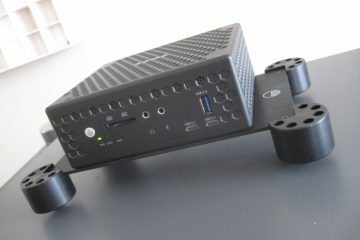 So it should be in a rack, for example a Spider Rack and Ceraballs for feet works very well. This lends the machine some more air and makes for better PRAT. Also, Lapp cables tend to make the Wadia darker and more bass-heavy than it can be. 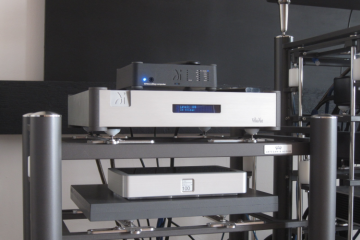 Belden powercords work well, while Cardas Hexlink Golden 5C makes the most of Wadia’s liveliness in the midband. But it also takes away some of the air that other cables lend it. Transparent is more fluid and Cardas Golden Reference meets these cables halfway. It’s slight lack of scale is not easy to compensate for. For example when we tried the most lively cable we have, the Cardas Hexlink Golden 5C, it makes the Meridian more bold and indeed lends the bass more authority. But it takes away some of its natural and fluid highs. They become somewhat more gray with this cable. Rather I prefer the Transparent Ultra which highlights the Meridian’s strengths. Putting the player on Ceraballs proved hit and miss as well. Indeed it becoms more fast and even more agile but again it takes away from it’s naturally beguiling presentation. So its tiny rubber feet actually work in its favour. The main weakness being a slightly less smooth HF, this is easily compensated by using a different powercable such as a different Lapp we had lying around. What also worked very well was Harmonic Technology Pro ACII. This cable is ultra smooth and a bit relaxed but not at the expense of speed and since the Audiomeca is very quick and lively, this is a very good match. 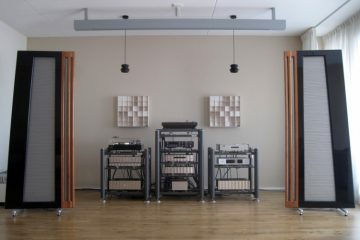 The Transparent interlink we used all along proved to be a very good match in that it, too, made the highs more fluid and at the same time tamed the somewhat jumpy and clean character of the Audiomeca. Cardas was too lively in the mid and too bombastic for this dac. Since the Krell had its downsides mostly in the bass and mid department, we tried bypassing it’s feet. These feet are part of the transport suspension and are spring-loaded. Bypassing them therefore would probably not be painless but we tried it anyway. Well yes, using Ceraballs, it becomes a lot tighter and faster. But just like with the Meridian, it seems we are pushing the player in a direction it doesn’t want to go. It starts shouting and the stage flattens, losing all beguiling fluidity and calmness we appreciated before. Going back to using the player with its own feet, we tried swapping the Lapp powercable for a belden but this made matters worse. 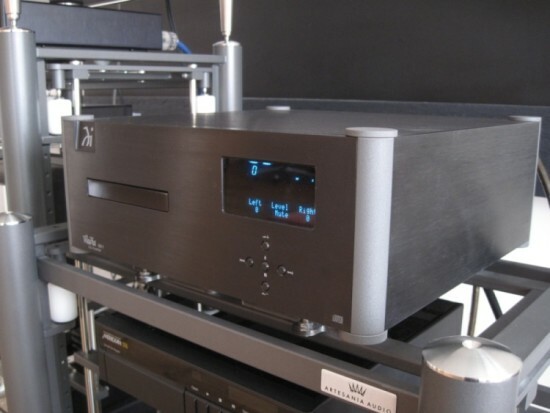 Perhaps the Harmonic Tech could’ve done it’s trick but in this review it wasn’t available because it was connected to the preamp. And we put it to good use, starting with the CEC as a transport. Our first response was: WOW! We’ve got the creamy-smooth highs AND more presence along with more potent bass. This was a really pleasing sound. We played several cd’s and all seemed fine. Until we started hearing a slightly muted midband again. Somehow the Krell just loves to take things easy. Sure, it’s plenty powerfull, detailing and soundstage are fine but somehow it doesn’t really come out like the Audiomeca does, and the Wadia, and even the Meridian. As soon as you’ve acclimatised to the Krells creamy-rich presentation you start longing for more action. And there was nothing we could change about this with cableswapping. Wadia is easily the most realistic, acoustic “live” player. It has reall mass and makes you feel part of the music as singers stand out from a broad soundstage. The bass makes your feet tap and keeps you interested. But for me, in my setup, I miss the fluid highs that other players are capable of. Meridian astonished us with what it’s capable of at such a comparatively low price. Krell is lovely and for some music styles; completely seducing and capable. But for PRAT and liveliness it is not the machine of choice.